Now that it is halfway through the season your hockey equipment has likely acquired a wonderful and unique odour, a stench that would put a skunk to shame. Don’t worry, I am here to help, in this article I will teach you how to prevent (or delay) your hockey equipment from stinking, and also how to get the stink out of hockey equipment once it starts to smell. Stinky hockey equipment is a normal problem that almost every hockey player has, luckily I have found a few easy ways to deal with it. There are a few ways to prevent your hockey equipment from smelling in the first place, I have discovered these methods over about 20 years of playing hockey. Player recommendation – I only use an Under Armour shirt, but a friend of mine says he uses the entire under armour layer (or a base layer from Bauer) to cover his entire body. He said that he airs it out and washes it regularly and he has never had a problem with his hockey equipment smelling. Tip 2 – Stink Prevention: Step two Air that Stuff out! Usually I keep my socks, jock and Under Armour in the side pocket of my bag so I can pull them all out at once. What to hang your gear on? You can buy some cheap shelving units if you have a place to set it up, a sports drying rack is also an option (links included in the product section below), I use the Gear Monkey, you could build something similar if you use your imagination. Put it in the wash machine! Tip – If your hockey equipment REALLY stinks rinse it first buy filling the wash machine, letting it soak, draining it, and then put it through a proper wash cycle. What Hockey Equipment can go in the wash? Washing machine warnings – If you have Velcro straps try to attach them to their Velcro partner, otherwise you can end up with a birds nest of equipment. Do not use bleach. Bleach can deteriorate your padding, I used it once with my old hockey pants and the foam started falling out of my torn and ripped pants (I had them for 10 years anyways). Out of the 10 years I have been washing my hockey equipment in the wash machine this is the only time I have wrecked anything. Top loading machines may rip some equipment if you don’t allow enough room for the hockey equipment to move. I don’t like to put any of my equipment in the dryer however it is fine to put your socks, jock, jerseys and Under Armour in there. I have put my hockey gloves, and elbow pads in the dryer before however I think it is not good for the leather palm. The easiest way to dry out all your gear after you have put it through the wash is to simply leave it out to dry and point a fan at it. If your hockey equipment still feels fairly wet after going through the wash you can move it around a bit (to re-balance the load) and run it through the spin cycle one more time and then put it out to dry. Rocket Dryer – I have heard great things about this from A LOT of guys on hockey forums. This is the ideal product for people in apartments or traveling in hotels and need to dry the gear out quickly. With the Rockey Dryer you simply hang all your gear up on a carousel type hanger, then put the big nylon type cover over it and turn on the fan. It quickly dries out everything. It has a timer, heating system, and a carrying case for road games. Sells for $149.99 on Amazon update: The ratings on this have dropped, but the price has not. Most complaints are about the quality so I think they switched manufacturers. I found what looks to be a MUCH cheaper generic version with much better ratings. Shelving unit – A cheap wire shelving unit or a better quality plastic one is good for storage, and also good to lay your equipment out on between games and practices. Hockey Equipment Drying Rack – These racks sell for about $50 a piece and are good to tuck in your furnace room or garage and hang your equipment on. If you use one of these in a room without much air circulation I would recommend turning a fan on for about an hour to help dry the stuff out a bit faster. Hockey Equipment Spray – I’ve used a few sports sprays but only noticed short-term results. The only thing that has worked in the long run is drying the stuff out and washing it (as described above) when the smell accumulates. If your equipment doesn’t smell that bad or you need something to tie you over while at a tournament this stuff should work. It has the highest rating on Amazon. Put them in the wash machine! Hockey skates are tough to wash because of their design. Prevention – The best thing you can do (a tip from a power skating instructor who spends almost all day in his skates) is take the insole out after each game or practice and let them dry out completely. Taking the insole out helps get all the moisture out. I also like to wear fresh socks in my skates, this keeps the built up odours already in your shoes and boots from getting into your skates. I use thinees (thin socks for hockey) and air them out each time. After about 4 times of using and airing them out I wash them or swap them with another fresh pair I have in my hockey bag. Taking out the insoles also helps keep your rivets from rusting. Dealing with Contaminated skates – If your skates already stink you can try some of the special sports gear sprays to neutralize the odour, or just spray and wipe the insides out with a wash cloth and some vinegar and then let them dry out completely. It will take a number of treatments before you can get them to smell better, but over time the smell will get a bit better. What about goalie pads and chest protector? Can they go in the washing machine (I have a front loading one that is big enough to hold them)? Thank you so much for the simple advice. Our son is 14 and the pads smell worse than ever (he’s in his 10th year of hockey). I always figured that laundering the pads would ruin them, so I never had. I gave a bath to the hockey shorts (which I have washed before), the hockey pants, and the shoulder pants last night with laundry detergent and Borax in the tub. They’ve been drying in the bathroom on hangers for 12 hours and are surprisingly nearly dry. Again, thanks. The stench was so bad that you could smell it even when the bag was closed! 🙋🏻 Hello! I’m a Hockey Mom and am sooo happy to see this article! It’s been many years that I have tried to get any/all odors from the hockey equipment..going to try your suggestions! Even after washing they still have a “smell”! For jerseys, socks, undergarments try ODO-BAN (comes in a spray and even a gallon size bottle)..ADD TO WASHER WITH YOUR LAUNDRY DETERGENT.. when worse comes to worse, I fill a squirt bottle,3/4 way with warm water— mix a few capfuls of the ODO-BAN and Downey softener (together), spritz and hang to dry out ! HELPS a bit! BUT THE SMELL OF SWEATY CLOTHES—nothing like it! My friend gave me a norwex product that worked wonders on my sons stinky hockey gear! I highly recommend trying it! Stinky gloves and skates are the worst. Wearing an Under-Armour of some sort, airing out gear and the occasional washing in the machine is a must. One of the things that I discovered is silica gel. You know those little white silica gel packets that come in the box with your brand new shoes? Don’t throw them out! After each game I put one in each of my skates and gloves. I also have a larger silica gel pack that I keep in my bag. Totally works, but you still have to air them stuff out. Sorry, no getting around that. The only things that I don’t put through the machine are obviously the pads, mask, skates and gloves. I’ll rinse the mask under the tap depending on how often I’ve played (I do it every 2 weeks) and air dry. Use bathtub or wash basin or large bucket to soak the gloves in an “Oxy Clean” bath overnight and rinse next morning, air dry on rack in front of a fan. I also have a routine of applying a hand sanitizer to my hands before each game to help control the smelly bacteria in my gloves. I also use a deodorizing/antibacteria spray all over and inside my gear after every use to control the smells. I play ball hockey 3 – 4 times a week in very warm and hot places. I sweat more and my gear gets wetter than when I played ice hockey, so very important to dry out the gear. If you run out or can’t find a sports equipment spray, a 50/50 mix of water and rubbing alcohol will work in a pinch. Does that glove Bath get rid of puck marks? Hi Jeremy what should I do if my gear says it cant go into a machine or hand wash. Can I put it into a washing machine anyways or not. Maybe just wash it by hand in a tub or sink. You could try it on low speed. 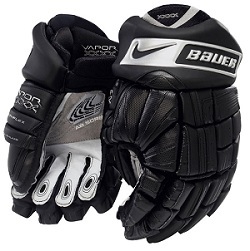 Wouldn’t wearing thin gloves (such as icebreaker glove for example) under the hockey glove be helpful to avoid smelly gloves? Or at least, do you think it would protect against MRSA? I haven’t seen players wearing such “under-glove” and I wonder why? I’ve never heard of it or tried it, but I guess it could help. The best thing for stinky gloves is just tossing them in the wash machine. I picked up a set of portable boot dryers from LL Bean a couple of years ago. I put them in my sons gloves and sometimes his skates. They came with a car adapter, which is nice for tournaments. They use radiant heat, so they do not get too hot. They are the “DryGuy” brand. They are awesome! Before you wash the gloves hold them over the washer and pour white vinegar into each glove, drop them in and wash. I also put a hefty dose (a couple cups) of vinegar all over the other gear before I run the load. Vinegar is cheap and it works. Don’t bother with all the other gimmicky sprays and powders and magic formulas. I use a laundry soap called Gear Wash. Bottom line this stuff is amazing. I know how good it is because of how long it last at keeping the odor/smell out of my hockey gear. Thank you very much work great. I used soap for surf neoprene, this very good to remove any smell. From old school, just put small cotton bag with Boon Coffee in gloves, it will make good smell. I made and now sell (shameless plug here! http://stickracking.storenvy.com/) simple, sturdy racks made from recycled hockey sticks. I put my rack next to a dehumidifier in summer and next to the radiator in winter. Have been reluctant to use washer but may try, certainly with the gloves. Hey jeremy Thank you for all teh awesome advice I do have a hubby who plays but I got used to his equipment beeing stinky now my 7 yold started to play and goodness. I do appreciate your advice great stuff. Good luck to you and all teh best. I make 4 versions of hockey racks. I see you we’re impressed with the rocket dryer. It use a heater tht produces 70 degree heat. For $120. a litle rich for my pocket book. My house is always 70 degrees. I produce the UHR short for the Ultimate Hockey Rack. It is the smallest, lightest hockey rack in the world blowing air through its pipes and its only $44.95. please take a look. http://www.ebay.com/itm/SPORTS-EQUIPMENT-HOCKEY-DRYING-RACK-TREE-with-AIR-/270875924699?pt=LH_DefaultDomain_0&hash=item3f117698db. My website is under reconstruction but I also make the goalie racks too. That stuff really works–like magic! It is a bit pricy….but….it really does work. I’ve used it for years. I’d recommend use where washing is not an option (like skates) or a temporary remedy pending washing is in order. Like Jeremy, I’ve put leather gloves & elbow pads (& sneakers) in the washing machine with no problems since the late 1980s! Leather dries best when it dries slowly (e.g. put some crumpled newspapers inside gloves (& shoes if soaked) to force drying from the outside, helped by a fan; why this works better I don’t know, but the leather will last longer, stays softer & is less prone to cracking from drying too fast). For larger items like shoulder pads & a girdle that won’t fit in the washing machine, I’ve used the soapy water going into the laundry drain tub (where the used soapy water goes on its way down the drain; many newer homes don’t use this approach), or the shower, then rinsed & let dry. Wash your car, wash your gear….with the same soapy water & then the hose clean[er]; dish soap that most of us use on our cars rinses very cleanly. You can do this in a couple of minutes and it makes a big difference. Make sure you let your stuff AIR OUT & DRY IN THE SHADE!!!! Almost all padding & associated fabrics do NOT resisit UV (part of sunlight) degradation. Some gear will fade from direct sunlight & some won’t — regardless, the UV rays are damaging & induce chemical breakdowns leading to premature material & equipment failures. Yes, direct sunlight dries things fast–and does kill some bacteria…but…it WILL slowly destroy your gear by weaking the very chemistry holding it together. Body oils, salts from sweat, etc., not to mention the fungi & bacteria & their waste products that cause the odors*, also contribute to slow chemical breakdown of the materials used in your gear (the anti-microbial stuff advertised a lot only slows this process down). If you like your gear & want it to last, wash it. Just plain rinsing regularly followed by good drying also makes a very big difference. * Get that? Much of the stink from stinky gear is from bacteria excrement. Bacteria crap. Think about that. Jeremy should I put bleach on my gloves while in washing machine? Ink can be a minor problem, but if you are careful not too rub the sheets in your gear and select the paper accordingly, it should work. Even placing loose sheets at the bottom of your bag will help trap the moisture. That’s the idea. Great article, and it’s so nice when you don’t gag on your own stink when dressing. This may be helpful for those with highly limited living space i.e. Apartment’s etc. Using a shower curtain rail and some PLASTIC coat hangers or strong suction hooks on the tiled surface is the cheapest way to effectively air out your gear. Added bonus is the exhaust fan. helps to circulate the air and speeds drying. A bathtub part filled with a mix of warm water and a good dose of anti-bacterial hand soap or mild shampoo like head an shoulders also works a treat for quickly hand washing the bulky gear every couple of weeks and gives it a nice fresh smell. Leave the fan running and most gear will dry overnight. For gloves and skates I’ve always found that the faster they dry out the better so sticking them in front of a heating vent (opening to the vent) gets them toasty and dry fast! That’s my two cents…hope it helps. Yeah, I hate smelling at practices or games, mostly because it’s just annoying. But I found that what I wear under the gear (shirt, jock, and socks) is actually what stinks. (sometimes the jersey, too, though. I also wash my outside socks just in case.) I dump all the stuff that’s not white in the washer and wash it with the rest of my laundry and it smells fine, though. My game jerseys are pretty nice, but I’ve washed them and dried them and they looked fine afterwards, except sometimes the tie came out. No lint or anything, and our dryer is ANCIENT. About washing gear, though – I don’t know. I’ve always been told that washing gear will ruin it, no matter what gear it is. A drying rack is really useful as well, though (probably why my gear doesn’t stink). I didn’t want to pay a ton of money for one, though, so I just grabbed some PVC pipes and plastic elbow/T connectors from Home Depot and made my own. It works great and fits in my bag if I need to take it apart for a tournament. Here’s a cheap solution for keeping your gear from stinking. Buy some 99% pure isopropyl from Costco. They come in 4- 500ml bottles for about $8. Mix it half and half with distilled water or if you like tap water and put into a spray bottle. After each game spray your gear down. It kills the bacteria that causes the smell. Special note expect your gear to take longer to dry so don’t do it if your playing back to back games. It’s essentially a poor man’s febreze without the smell. In fact your can use it year round for your stinking running shoes too. I wash all my gear and my kids gear regularly. Two things I learned not to do. 1/ The new front loader had a power wash cycle. It worked so well that all of my son’s equipment has a slight blue tint to it. Do NOT use the high strength wash cycle if you have it. 2/ I have washed my gloves regularly. They should go in a gentle cycle in the washer and NOT in the dryer. Air dry them or heat them through from the inside with a hair dryer. They got worn on all of the exterior surfaces. My four year is even getting in to the act of hanging up his equipment. He hangs his skates, helmet and gloves in his room after we skate in the back yard. He says “Just like Daddy does” Let’s hope he only picks up the good habits. 2- What soap to use? Found the best results from combo of 1 cup white vinegar + 1 cup washing soda (like baking soda but for laundry). Again, thanks for this and all of the inspiring and helpful work you do Jeremy! I use a fooseball table in the garage to hang my gear, shin pads, helmet and skates up top and everything else I hang from the rods on the side. Point a small space heater at it and bam perfect drying rack. I second the washing machine, but I did get a pretty good slice in my hockey pants once because they rubbed against the top of the basket during the cycle. The other option that has worked well for me is to put it all in a clean trash can with cold water and a little bleach [1/2 a cup in a full-sized plastic trash can], put something on top to hold the gear underwater until it soaks through, then air dry, preferably in the sun. To keep moisture and bacteria out of my bag and my hockey gear, right after a game, I stuff every item with newspaper sheets (shin pads, gloves, pants, helmet, skates, undergarment clothes, etc.). Yes, people look at you puzzled in the change room but ignore… 😉 When I come home, I remove all the wet newspaper sheets (you would be amaze how humidity builds up quickly) and spread my gear on top of new dry newspaper sheets to air out. It really helps. Wouldn’t all the wet ink stain the gear?